These spiced pecans are from China Grove, NC. A friend of our has a grove of pecans that produced a bumper crop this year. The three boys use the pecans to raise money for music instruments. So it is a great cause to support. I look forward to the Helms Farm Pecans every year. There are so many spiced and candied nut recipes out there, you can modify any one of them to fit your tastes. Personally, I love the sweet, salty, slightly hot flavor of these nuts. The warm spices enhance the amazing flavor of the roasted nut, the chili powder gives a slight amount of entertaining heat and the sugars make them indulgent. Imagine these with fresh pears and bleu cheese! Now, that is an amazing platter to put out with pre-dinner wine and champagne. Pre-heat the oven to 300°F. Line a baking sheet with parchment or use a silpat. Beat the egg white to soft peaks. If it is properly beaten, there will be no liquid in the bottom of the bowl. Tip: Wipe the bowl and beaters with vinegar to remove any possible oils that may be on the surface. This will ensure a successfully beaten egg white. While the egg white is beating, mix the sugar and spices in a small bowl. Beaten egg whites mixed with seasonings. When the egg is properly beaten, add the seasonings. Fold in the pecans and toss to evenly coat all of the nuts. Separate any nuts that stick together. Spread onto a lined baking sheet and roast in the oven for 30 minutes. Stir them occasionally for even roasting. Cool, separating any nuts that stick together again after roasting. Package and present as a wonderful gift for anyone! Please be aware that if you put these out for a party, they will disappear fast! I suggest you save them for a small group. This entry was posted in basic skills, Cooking, Recipes, Southern Cooking and tagged candied nut recipes, Egg white, food, Nuts and Seeds, Pecan, Produce, Shopping, Spice, Sugar, Teaspoon. Bookmark the permalink. This brought back memories of growing up in Texas. 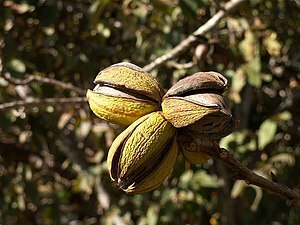 We had pecan trees on our property. I would pick pecans and then sell them for spending money. There is nothing better than candied pecans. Nice blog / recipe and thanks for the link! Welcome! I really like the lay out of your blog. Thank you, they are addicting too. Thanks for stopping by!